Because of Kate, I knew that my diagnosis was not the end of the road, that I would, like her, get well, and stay well. Kate’s story, and the story of others who have walked in her shoes, needs to be told again and again. Those of us with psychiatric illnesses need to know that there are many, many people who, like Kate, get well, stay well and lead rich, rewarding and valuable lives. Many of you have read Remembering Kate: A Story of Hope. 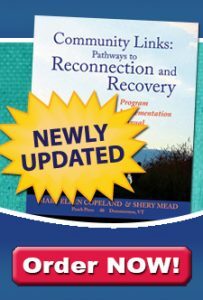 I have heard that WRAP group facilitators ofter refer to this story when they discuss the first of the Key Concepts of Recovery, Hope, in WRAP groups. I wrote this account of my mother’s life experience because, again and again, when times were most difficult for me, it was recalling this story that let me know that there was hope, that I would get well and stay well, just like she had. It was a beacon for me, a light at the end of the tunnel. Time and time again, it kept me from giving up. And I have heard that it has done the same for many others. A magnificent legacy to an amazing and courageous woman. If you haven’t read this story, I hope you will. In addition to the message of hope, and the message that you can rebuild your life after years of despair, there are other lessons and “Wellness Tools” that I learned from her experience. I hope they will be helpful to you. 1. Messages of hope help. Dire predictions about the future don’t help and always hurt. 2. Assess your life with supporters and find ways to reduce stress. 3. Talk and talk and talk while being heard by a non-judgemental and supportive listener. 4. Get affirmation and validation from people you trust. 5. Join a support group or a WRAP group. If there is no group in your area, start one. 6. Connect with people whose life experiences are similar to your own (peer support). 7. Stay in touch with people you like and love. Don’t let them disappear from your life from lack of attention. 8. Surround yourself with loving and caring family members and friends. 9. If one way of doing things doesn’t work, try a different way. 10. Pleasant comfortable surroundings, not like those in most of the old hospitals and institutions, support recovery. 11. Eat healthy, nourishing foods. Limit your use of alcohol, excessive caffeine, and sugar. 12. Try not to get overtired. If you get overtired, rest. 13. Be careful that our children aren’t feeling that they are responsible for our hard times.